Have you noticed the yellow growth on our Heritage Phone box? 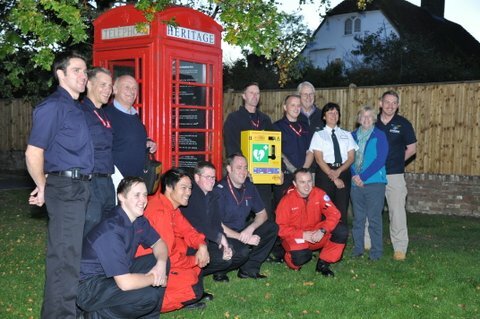 This is the village’s new defibrillator. It is only with David McFarland’s insight and determination that this has been achieved. Fund raising was about to begin, backed by the Marden History Group, when a guardian angel of a donor appeared to provide the necessary finance. 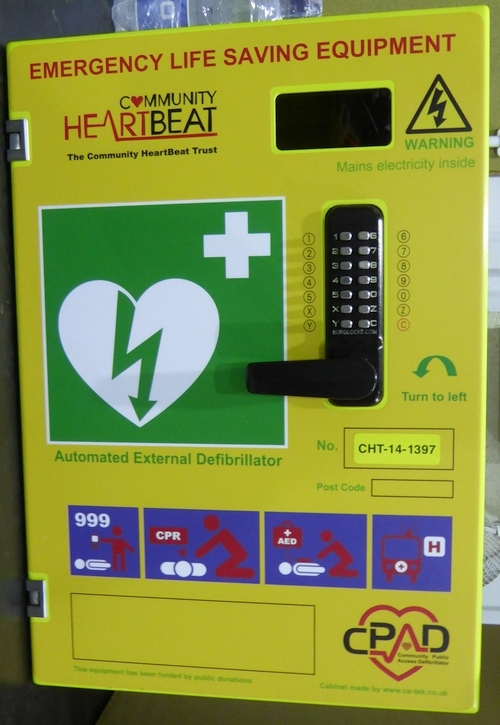 The best equipment was suggested by the Community Heartbeat Trust, who has advised us along the way. Once again our brilliant firemen sprang into action and actually fixed it in place. 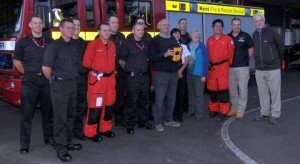 They have also volunteered to give informal training on how to use it. 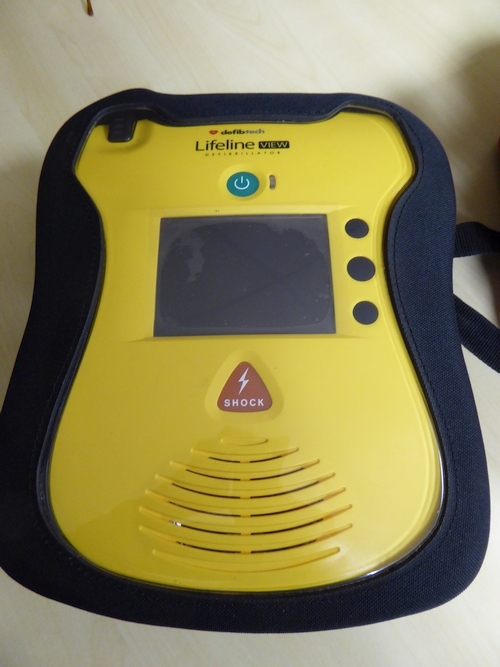 In an emergency you ring the number provided and then you will be given the code to unlock the defibrillator. We are assured that it will do no harm as the machine itself will detect if it needs to work. 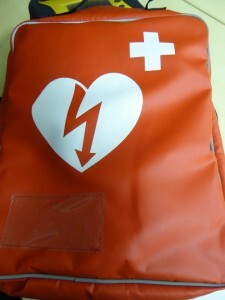 The important thing is to also keep chest compressions going whilst waiting for an ambulance. At the inaugural meeting to launch this we had representatives from the South Coast Ambulance Service, the Community Heartbeat Trust, the Marden Fire and Rescue Service, the Kent, Surrey and Sussex Air Ambulance, the Parish Council, the Community Warden and Marden History Group. 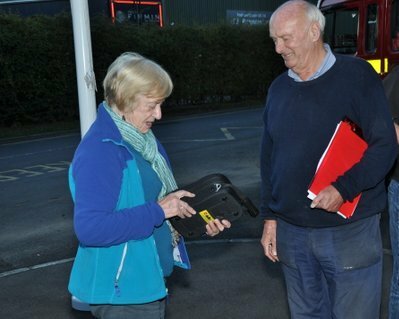 Eunice Doswell, deputy and David McFarland, chairman of Marden History Group examining the defibrillator – A. L.
The box with the key code which holds the defibrillator. E. D.
The thermal storage bag. 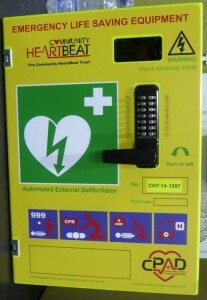 E. D.
The defibrillator. – E. D.
Inauguration meeting at the fire station on 9th October 2015. A. L.
The meeting moves to the telephone box site. A. L. Photos by Eunice Doswell and Andrew Lyon.